Magnetic strips work really well in the kitchen, especially if you have minimal drawer and counter space. Plug one onto your wall and let the hanging begin! Make sure you install the strip in a easy-to-reach, convenient space. Keep in mind that you want these utensils to be accessible where you'll be employing them. 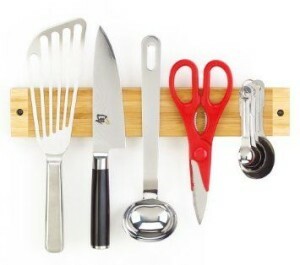 For example, if you cover your magnetic strip in knives, hang it over counter space which has room for your cutting board. Ya hurd?